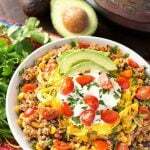 Instant Pot Quinoa Taco Bowls are a healthy and delicious one-pot meal. This is an Instant Pot Dump and Start recipe, so it’s very easy to make. 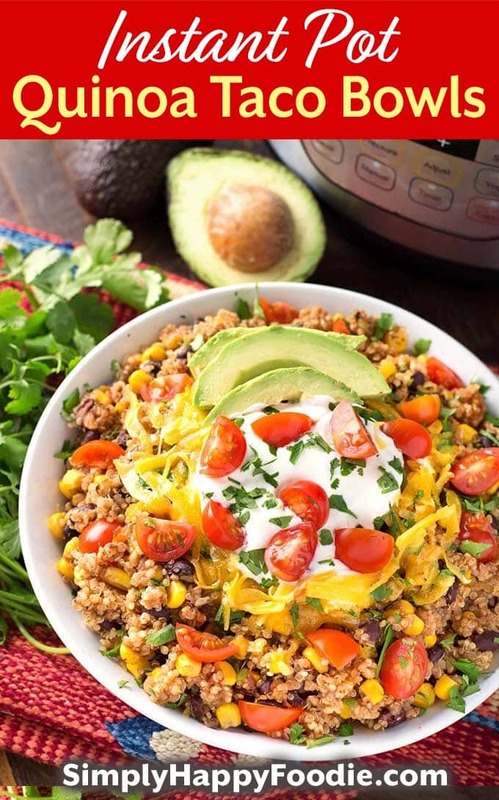 This delicious pressure cooker quinoa taco bowl recipe is also vegetarian and vegan. A great Instant Pot meal prep recipe! Healthy doesn’t have to be boring. Anything taco flavored is not boring, in my book! I like quinoa, but without great flavors to add to it, I wouldn’t eat it. Gotta have flavor! Quinoa is a lot like rice or tofu in the way that it takes on the flavors you add to it. Instant Pot Quinoa Taco Bowls have the healthy base of quinoa, and the tasty flavors of tacos! Cooking quinoa in the Instant Pot is pretty fast. It only has a one minute cook time, and a 15 minute natural release. I love that all of the ingredients cook together at the same time in the pressure cooker! The toppings are the fun part! I love adding cheese, sour cream, jalapeño, and fresh tomatoes to my serving. Don’t forget the avocado! With this being a dump and start recipe, you can just layer the ingredients in the pot and set the cook time and start it. So Easy! 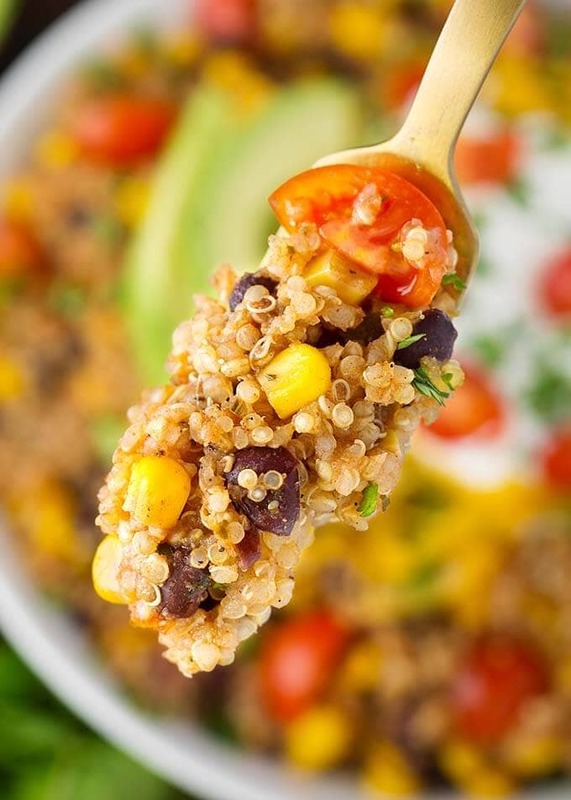 This pressure cooker quinoa bowl recipe is perfect for meal prep. You can get 5 servings out of this recipe. It reheats nicely. 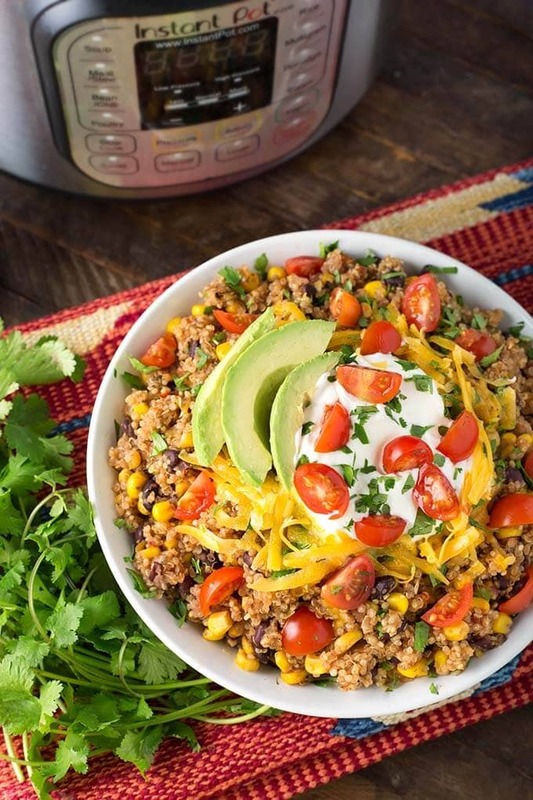 Instant Pot Quinoa Taco Bowls are a simple and delicious, healthy one-pot meal. This is an Instant Pot Dump and Start recipe, so it's very easy to make. Great for meal prep! Add all ingredients to the pressure cooker in order listed and place the lid on. Set the steam release knob to the Sealing position. Press the Pressure Cook/Manual button or dial, then the +/- button or dial to select 1 minute. High Pressure. When the cook time has finished, turn off the pot and let it sit undisturbed for 15 minutes. Then manually release any remaining pressure by turning the steam release knob to the Venting position. Fluff with a fork and serve with any garnishes you like. Package the garnishes/toppings in separate containers. Then divide the quinoa evenly between 5 meal prep containers. Keep refrigerated. To reheat, microwave for 1 to 2 minutes, stirring halfway through. Add the garnishes after reheating. Thank you for a vegetarian recipe that tastes good. We all enjoyed it.